At Trinity Care Adult Day Care Center in Morrow Georgia our nurses are compassionate and loving and are specially trained to meet the care needs of Seniors. Our team includes Registered Nurses and Licensed Practical Nurses who actively participate in the daily activities of the center. 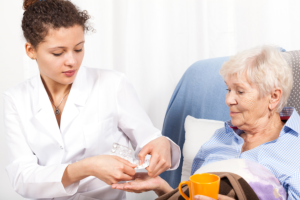 Our Nurses monitor and observe our participants, administer medication and coordinate services with the prescribing physician and pharmacy if prescription refills are needed. Trinity Care is also affiliated with local community pharmacies who can provide participants with Medication Therapy Management, Drug Interaction Reviews and Auto Prescription Refills.